When I stepped into the kitchen last night I wasn’t in the mood to cook. I was thinking “it’s too much work” and “what am I going to make”. Cleary I wasn’t in the right frame of mind. It would have been easy to just order take-out but the day before we had pizza at the cottage and a take-out meal on the drive home. I knew that wolfing down another take-out meal would only increase my stress levels about what I was eating…and that’s no fun. So I found the energy to turn on some music and chop an onion. I didn’t have any particular meal in mind. However once the music cleared away my stressful thoughts I instantly thought about what I could make. By setting the right mood and getting the process started I removed the mental barrier of cooking and ended up putting together a nice tomato tortellini pasta dish. It took about 20 minutes (less time than it would have taken for take-out to arrive at my house). If you’re looking for a healthier, fitter and more vibrant you then it’s really important to keep track of what you eat. Write it down on a list and post it on your fridge. 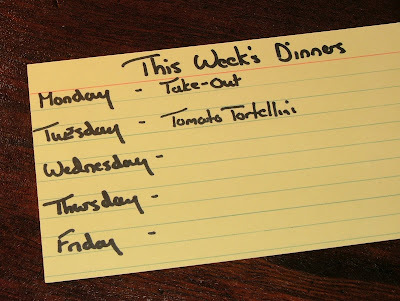 Review the list daily to determine if it’s time to lay off the junk food and make a good-for-ya meal. It’s also important to not over think cooking and make it harder than it is. Find the boost to get you started. Once your moving you’ll often find meals will come together quicker than you originally thought.